Upleatham is a village in the unitary authority of Redcar and Cleveland and the ceremonial county of North Yorkshire, England. The village was mentioned in the Domesday Book and the name derives from Old English and Old Norse as Upper Slope, in that it was further up the hill than Kirkleatham. An ironstone seam that was 13 feet (4.0 m) thick was worked beneath the village which meant that some dwellings were lost to subsidence. The mine operated between the 1850s and 1924 with reserves of ironstone being estimated at a little over 36,000,000 tonnes (40,000,000 tons). The landowner of the time, the Earl of Zetland, allowed the mining company to extract the ironstone from underneath the village provided that the area around the church was left undisturbed. This is why the conservation area in the village is just a small selection of buildings clustered around the church. The arrival of the ironstone mine increased the population of the village from 204 in 1841 to 1,007 in 1861. It has a small grade II listed church, believed by some to be the smallest in England, although Bremilham Church in Wiltshire is actually slightly smaller. The village is located near New Marske, between Saltburn and Guisborough; there are a few rows of houses which are adjacent to Errington Woods. ^ Powell-Smith, Anna. "Upleatham | Domesday Book". opendomesday.org. Retrieved 28 October 2017. ^ Ekwall, Eilert (1960). The concise Oxford dictionary of English place-names (4 ed.). Oxford: Clarendon Press. p. 487. ISBN 0-19-869103-3. ^ "Durham Mining Museum - Upleatham (Ironstone)". www.dmm.org.uk. Retrieved 28 October 2017. ^ "Upleatham Conservation Area Appraisal" (PDF). redcar-cleveland.gov.uk. 2011. p. 9. Retrieved 28 October 2017. 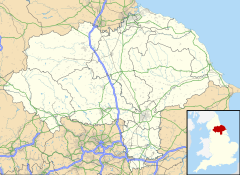 ^ "History of Upleatham, in Redcar and Cleveland and North Riding | Map and description". www.visionofbritain.org.uk. Retrieved 28 October 2017. ^ Historic England. "Church of St Andrew (Grade II) (1159780)". National Heritage List for England. Retrieved 28 October 2017. ^ "The old church of St Andrew, Upleatham". cumbrianchurches.blogspot.co.uk. Retrieved 9 January 2017. ^ "Upleatham Church (almost) the smallest in Britain". Hidden Teesside. Retrieved 9 January 2017.